Since the emergence of NdFeB onto the permanent magnet market, followed by an extended period of price reduction and an almost continuous improvement in properties, permanent magnet devices have been steadily getting smaller, lighter in weight and consequently more efficient..
Whilst ferrite materials are cheaper than rare-earth materials, and for low cost applications or applications where space constraints are not an issue rare-earth designs can be replaced with ferrite designs relatively easily, the significant lower energy product of the ferrites and other disadvantages simply make them not viable for many modern applications. 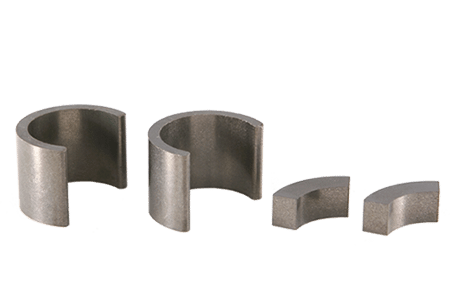 Bonded magnets such as BREMAG however, have a much higher energy product than ferrites and therefore can be considered for many more applications, and the fact that they are dysprosium free unlike sintered NdFeB means they will have more price stability and often reduced cost. 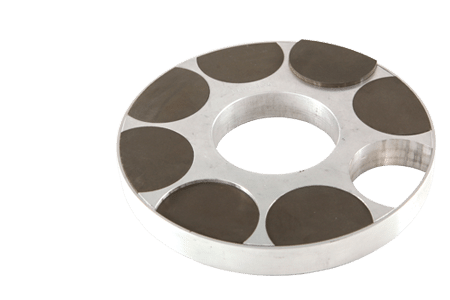 This combined with the other advantages such as ease of manufacture, high tolerance net shape manufacture, and post assembly magnetisation make BREMAG magnets very much a viable alternative to even sintered NdFeB. In the case of sintered rare-earths, if the main criteria for magnet selection is purely maximising the energy per unit volume of magnet, then BREMAG magnet materials cannot realistically compete. Typical remanence values for sintered NdFeB magnets are now in the region of 1.3 to 1.4T compared to 0.7T for BREMAG magnets. Equally energy products of the sintered NdFeB are in the range of 35 to 52MGOe compared to 10MGOe for BREMAG. While anisotropic bonded NdFeB magnets are now possible, with remanence values in the region of 0.9 to 1.0T they are still a long way short of sintered magnets and tend to be either limited to injection moulding applications where the volume of binder materials is higher and the material flows more easily or to very simple block shaped compression moulded parts. Of course the higher volume of binder reduces the magnetic properties further, but when compared to injection moulded isotropic NdFeB or ferrite there is a place for this material and they do find some niche applications. However, as long as size constraints do not preclude the use of bonded rare-earth magnets, then materials such as BREMAG should always be considered as a viable alternative to sintered rare-earths, particularly for brushless dc motors and when the cost of the whole manufactured assembly is considered. The cost savings that can be achieved, by pressing a single piece ring magnet, that can be glued onto a rotor hub of a brushless dc motor in one single operation are potentially very significant when compared to assembling and gluing a number of individual pre-magnetised high energy magnet segments that either repel or are attracted to adjacent magnets, increasing the potential for chipping or cracking the magnets as they attach themselves to the steel hub due to the brittle nature of the material. 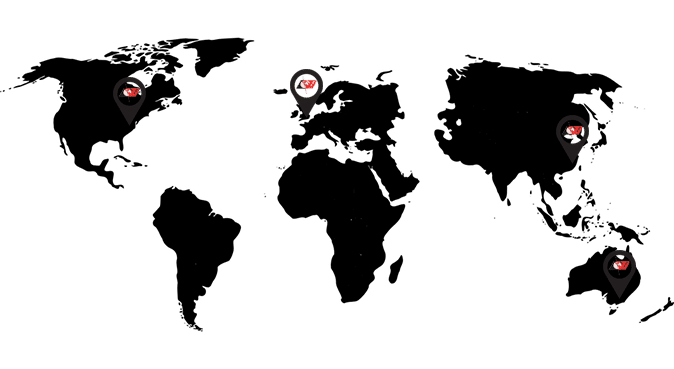 Features can often be added to the magnets to aid location or alignment of the poles and in some cases it is also possible to over-mould the magnetic material directly onto a rotor shaft or hub. 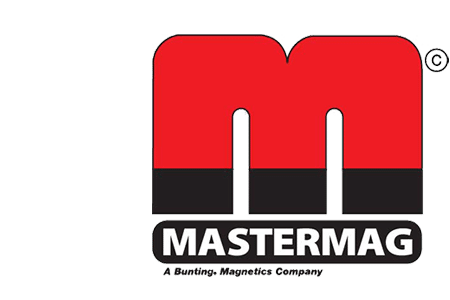 For companies that produce a range of motors with perhaps with different pole numbers, there is the potential for using one single magnet ring for a number of different products simply by using different magnetising tools to change the pole number of the magnet. 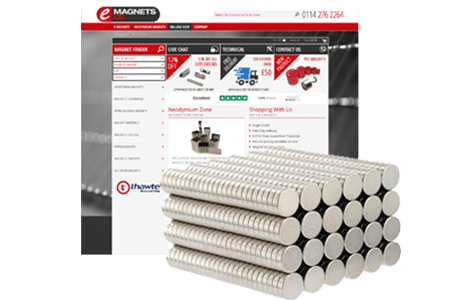 In the case of sintered rare-earths, a change in pole number requires a completely different size of magnet segment, with more parts and labour costs for assembly as the pole number increases. 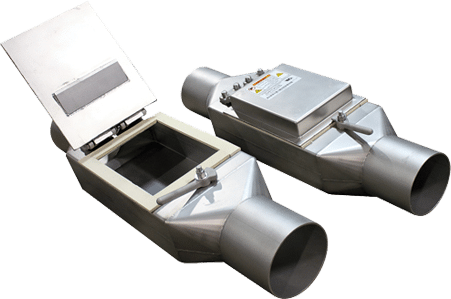 In addition to the manufacturing savings there are the magnetic benefits of lower eddy current losses, and being able to have different shaped magnetisation waveforms such as trapezoidal, sinusoidal or skewed. In summary, BREMAG materials should always be considered as an alternative to ferrites when there is a need to increase the magnetic energy or simply the field strength within a product and as an alternative to sintered NdFeB in order to reduce manufacturing costs, take advantage of the more complex magnetisation patterns that can be achieved or the environmental benefits of utilising Dysprosium free magnetic material that produces virtually no waste during its manufacture.